The UFC has officially announced WEC lightweight champ Anthony Pettis will make his big league debut against Clay Guida at “The Ultimate Fighter 13 Finale.” The June 4th event takes place inside The Pearl at The Palms Casino Resort in Las Vegas, Nevada. “Anthony Pettis and Clay Guida both want to prove that they deserve the next shot at the lightweight title,” UFC president Dana White said. 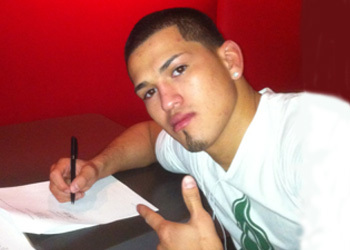 “Pettis comes in to the UFC with a lot of hype. He was the last WEC lightweight champion and became a superstar after landing that incredible kick off the cage against Ben Henderson, but this is the toughest fight of his career. Following UFC 128 this past Saturday, White stated Pettis would advance to a championship affair should he win. He took a “we’ll see” approach regarding a victorious Guida. “The Ultimate Fighter 12” winner Jonathan Brookins will also face Jeremy Stephens in a 155-pound clash. Speaking of TUF, a welterweight from the 13th season of the popular reality series will also earn a six-figure UFC contract during the freebie fight card. UFC Fight Club members will have the opportunity to purchase seats for the show on Wednesday, March 23rd at 1PM ET/10AM PT via UFCFightClub.com.